Oblique view of two fresh impact craters in bright grooved terrain near the north pole of Jupiter's moon, Ganymede. 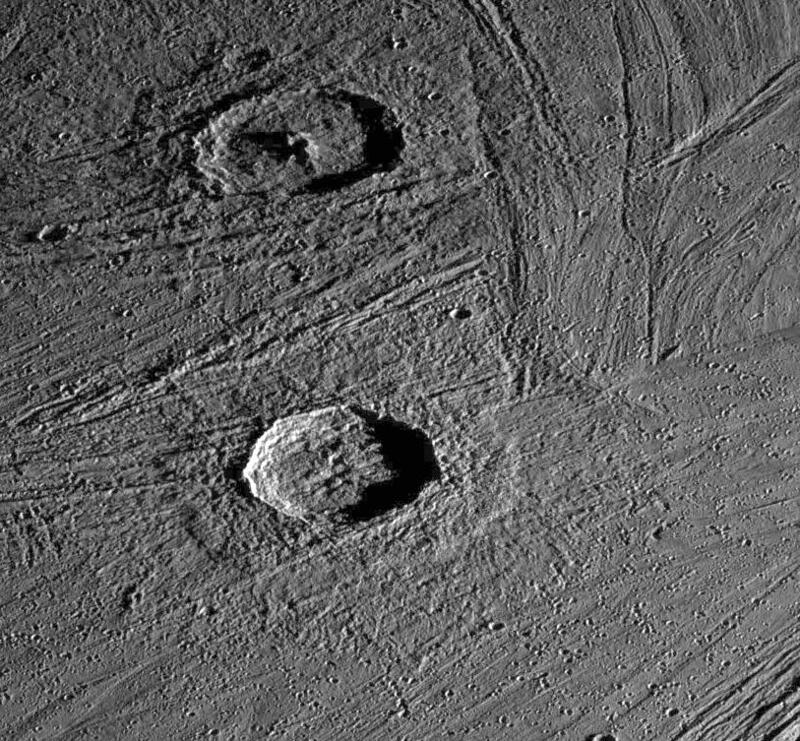 The craters postdate the grooved terrain since each is surrounded by swarms of smaller craters formed by material which was ejected out of the crater as it formed, and which subsequently reimpacted onto the surrounding surface. 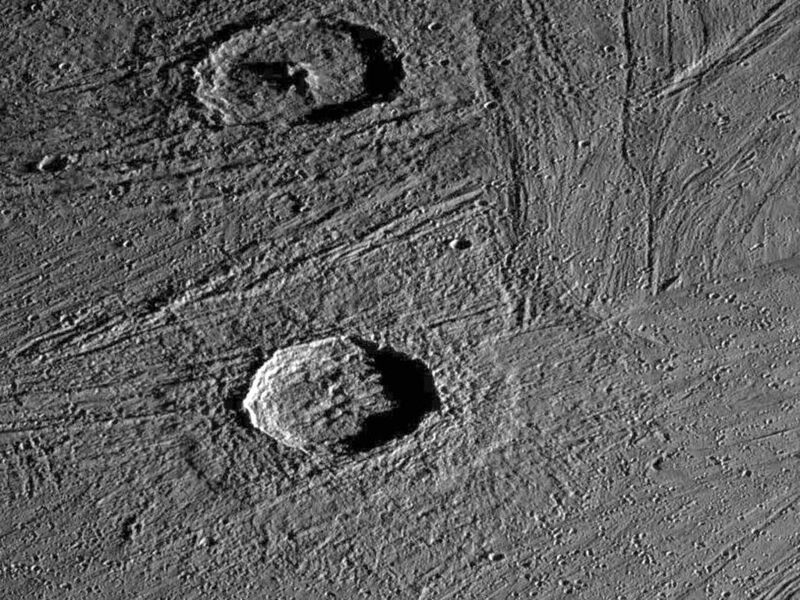 The crater to the north, Gula, which is 38 kilometers (km) in diameter, has a distinctive central peak, while the crater to the south, Achelous, (32 km in diameter) has an outer lobate ejecta deposit extending about a crater radius from the rim. 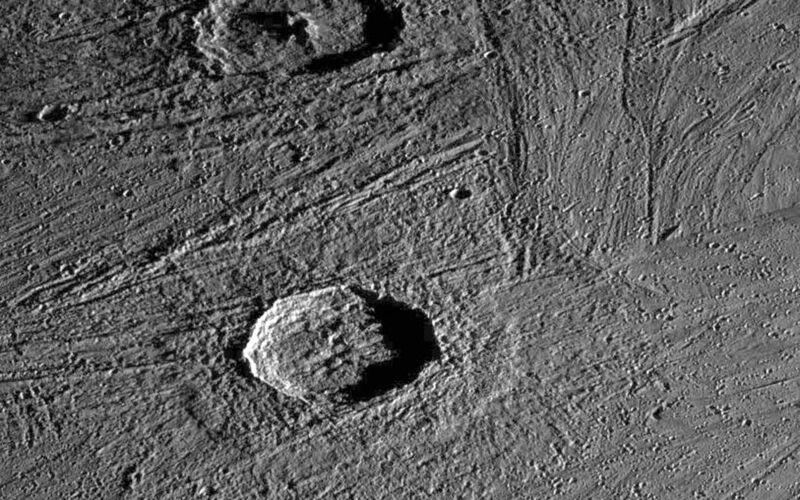 Such images show the range of structural details of impact craters, and help in understanding the processes that form them. North is to the top of the picture and the sun illuminates the surface from the right. The image, centered at 62 degrees latitude and 12 degrees longitude, covers an area approximately 142 by 132 kilometers. The resolution is 175 meters per picture element. The images were taken on April 5, 1997 at 6 hours, 33 minutes, 37 seconds Universal Time at a range of 17,531 kilometers by the Solid State Imaging (SSI) system on NASA's Galileo spacecraft.